The Flyers looked good at least fashionably yesterday afternoon, taking the ice in their new retro orange third jerseys, but didn’t look so good in terms of play as they were beaten in overtime by Carolina, 3-2. Outshooting the Flyers 30 – 26, the Hurricanes played well defensively thanks in part to the Flyers propensity to overpass in the offensive zone. Too many times they neglected to shoot when in decent position and instead tried to make a pretty set-up. Just get the puck on net when you’re in good shooting range. Some early opportunities were lost with Jeff Carter missing on a breakaway and Mike Richards’ goal being called back because defensemen Matt Carle and Luca Sbisa both jumped on the ice to replace Ossi Vaananen, who came to the bench. Sbisa was up but Carle didn’t think Sbisa saw Vaananen, so he jumped on. Neither of them had anything to do with the goal but… (Just to digress for a moment, this reminded me of the Philadelphia Firebirds of the old North American Hockey League in the mid-1970s, whose coach would sometimes purposely put an extra player on the ice and, if they scored, would send the rest of the team off the bench to congratulate the scorer so the ref wouldn’t notice that there had been too many men on the ice. This was when it was permissible to clear the bench to celebrate a goal. It often worked! You gotta love minor league hockey. Jeff Carter scores to tie the game at 2. Sergei Samsonov scores the winner in overtime. It’s always fun to bust on the New York Rangers. One of the Flyers’ top rivalries has produced some memorable games and playoff series over the years. I have to give them credit right now – those punks keep winning. Surprising, because I didn’t think they upgraded their team all that much over the summer. Let’s see how long they keep it up. Too bad we don’t play them again until February 15. With the Flyers picking it up now, this would be a good time for a match up. 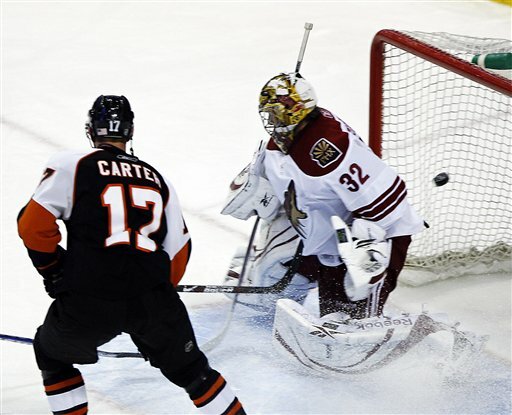 Jeff Carter showed why he is considered an emerging NHL star in last night’s 4-3 overtime win over the Pheonix Coyotes. With the Flyers giving up the go-ahead goal with just over five minutes remaining, Carter grabbed the game by the throat by scoring the tying goal on a deflection of Mike Richards’ pass with just over one minute left, then set up Richards’ winner in overtime by stealing the puck at the Flyers’ blue line, racing to center where he made a nifty behind-the-back pass to Richards who used Carter as a decoy and deftly held the puck until snapping it past goalie Mikael Tellqvist. Carter was all over the ice in the third period and his play is largely the reason that the Flyers won this game. He now has 14 goals on the season, second only to Buffalo’s Thomas Vanek, and compliments the offensive production with a strong defensive game, drawing checking responsibilities each night and killing penalties. The Flyers are continuing to play well, emerging from their early season funk, and have won five of their last six games. They finally got some help in the standings last night as the division rival Rangers and Penguins suffered losses. With four wins in a row now, we can start a nice winning streak. OK, things are starting to look better for the Flyers as their play has improved and they are getting out from under that horrible start to the season. The problem situations that led to the 0-3-3 beginning are being corrected. The defense is playing much better as coach John Stevens continues to try different pairings. Newly acquired Matt Carle looks good and has added a steadying influence and rookie Luca Sbisa continues to impress with his unflustered, quietly confident game. The forwards are playing with more attention to defense, coming back further into the defensive zone and allowing for greater puck support. Goalie Marty Biron has overcome a shaky start and appears to have settled into a groove. The overall effort from game to game has improved greatly. Other positives as we approach the 20-game mark are Simon Gagne, who is showing no lingering effects from the concussion that sidelined him most of last season and has been scoring at a very solid pace, among the league leaders. Penalty killing has been excellent, and the Flyers lead the NHL with eight short-handed goals. They’re on pace to break the NHL single-season record held by Edmonton in this category. The forwards are scoring and the balanced offense that led the Flyers deep into last year’s playoffs is continuing. The 2-1 victory in Montreal was the Flyer’ best game of the season thus far, a very solid effort from start to finish that shows that the Flyers can be one of the top teams in the league if they can maintain the consistency of effort that is necessary to win games. I swear that the last post was written before the Flyers announced the trade of Steve Downie and Steve Eminger to Tampa for defenseman Matt Carle plus a swap of draft picks. I had indicated that Downie looked like a first round draft pick bust and that Eminger’s poor play made his acquisition over the summer Holmgren’s worst trade to date, and suggested that Holmgren may have to trade a forward for a solid defenseman. I think this is a really good deal. Eminger was terrible and Downie will be a fourth line player at best. 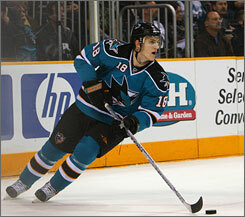 Carle is a solid top-four defenseman who is quick, has decent size, can move the puck and is young. Although his offensive production has trailed off since his rookie season with the Sharks, if he can move the puck and cover well in front of the Flyers’ net, this will be an improvement. The only concern is that now we have no right handed shots on defense. Still, this should help. Now, let’s trade another forward (Asham?) to gain space under the salary cap and then sign Brendan Shanahan. Too familiar a scene this season. Defense: Terry Murray’s departure has hurt. The training camp injuries to Randy Jones and Ryan Parent have caused difficulty. The pairings were affected and blueliners will need time to develop some familiarity and chemistry with their partners. Newcomer Ossi Vaananen has played pretty well, but Steve Eminger has shown some glaring problems regarding coverage in front as well as a propensity to fall down like he did at the blue line in the 4-1 loss to Ottawa, leading to a break for the Senators while the Flyers were on the power play. Trading a first round pick for this guy was Holmgren’s worst summer move. Holmgren traded for Andrew Alberts after the season bagan, but he has not played particularly well and at 6’4 could play a much more physical game. If Jones and Parent come back and play like they were in the playoffs, this situation can correct itself but there’s another “if”. Can someone tell me why they didn’t try harder to re-sign Jason Smith? Luca Sbisa has been a fantastic surprise, second now to Timonen with over 20 minutes per game, but remember he’s only 18. Will he be able to hold up over the course of a long season? Effort: This team looks as though they want to skip over the regular season and go right to the playoffs. Many nights, the effort just isn’t there. John Stevens has to find a way to get a consistent effort out of them, especially from the forwards executing their defensive responsibilities. Goaltending: Hard to lay too much blame on the goalies since the defensive coverage is so often lax, but neither Biron or Nittymaki have been great consistently. Who’s the number one goalie now? Face-offs: The Flyers’ centers have not done well winning face-offs this season, too often losing control of the puck off the draw and creating the need to work to regain possession. Face-offs are more critical this year with the rule change that brings the draw into the defensive zone after a penalty. Flyers great and face-off master Bob Clarke was recently brought in to give some pointers. On the positive side, the forwards are scoring goals as the Flyers are near the top of the league in goals scored. The power play is at about 25% efficiency – in the top three of the league. Penalty killing is respectable. Gagne looks completely recovered from the concussion; Sbisa has played really well. Other negatives – Steve Downie is sent to the Phantoms. He looks like another first round draft pick bust. Why is Aaron Asham on the team? Overall, some work to do in the coaching department and Homer may need to give up a forward for a good, solid defenseman – if he can find one.